Most brides already know they are going to need to get their dress altered even before they go gown shopping. 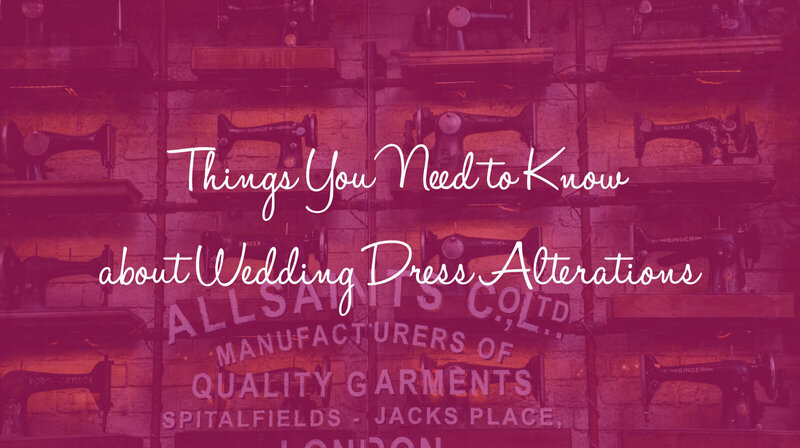 But, there may be some things that they don’t already know about wedding dress alterations. Before you’re hit with a surprise more unpleasant than a pin stuck in the wrong place, read our list of ten things to know about the alteration process. You already know that you should gown shop well in advance of the wedding. Once that gorgeous dress has come in, don’t wait until the last minute to make necessary alterations. Most quality seamstresses have a long list of clients and it may take some time for her to complete the work. Plan for the alterations to take several months from the first fitting to the final one. Still, if you go too early for wedding dress alterations, the dress may not fit properly on your wedding day. A dress that fit like a glove six months ago might be too loose or too tight on the morning of your wedding. Leave yourself some time between the alterations and the big day – but not too much. Many bridal salons, but not all, offer alterations on the wedding dresses that they sell. While we have a few contracted seamstresses at The White Dress, we do have several trusted external seamstress we work with who can make those essential adjustments. It is good to keep in mind that some brides order their dress in a town that’s quite a ways away from where they live or where they plan to have their wedding. Because of this, it may be necessary for you to look for a seamstress or tailor closer to home, which can help save travel time back and forth from all of those necessary bridal fittings. If this is the case for you, be careful to find someone with experience in wedding dresses and formal eveningwear. Ask friends, check reviews, and meet with the seamstress in person before turning over your wedding gown. Your wedding dress is a huge investment and an emotionally significant garment. Don’t risk bad alterations ruining it beyond repair. Don’t show up to your wedding dress fitting without your shoes and your undergarments. A different bra or rigid shapewear can make a huge difference to the fit of the dress. Similarly, even an inch or two difference in heel-height can dramatically change the ideal hemline for your gown. The hem should just graze the ground with your shoes on, so make sure you are wearing your Cinderella slippers as they do the pinning. A skilled seamstress or tailor can make your wedding dress truly unique. During the wedding dress alterations, you can often add sleeves or straps, replace a zipper with a corset back, add buttons, and choose a unique bustle style. These bespoke details make your gown stand out from the crowd. Remember, it’s not advisable to buy a dress you want to make major changes on, even though some simple wedding dress alterations can improve a dress you already love. If there’s something that you can’t live without, be sure to confirm it can be added during the alterations process before you buy your gown. Complicated alterations, like taking a dress down several sizes, can cost hundreds of dollars, and even simple changes like a hem can be over two-hundred dollars. Wedding gowns are complicated creations, with delicate, hard-to-work-with fabrics and detailing. When you budget for the dress of your dreams, be sure to plan for what you will spend on wedding dress alterations as well. Otherwise you might be hit with a surprising bill later. Wedding dress alterations aren’t an exciting event. You don’t need a gaggle of bridesmaids helping you choose between sewn-in cups or a strapless bra. Still, you could use an expert eye to make sure everything looks good before the big day. Bring your mother, a sister, or another close confidant along for support. Also, be sure the maid-of-honor comes with you for the final fitting so that she can learn how to bustle the wedding gown. There are a variety of bustle styles, and some are quite complicated. A little practice means you won’t be struggling with ribbons and buttons on your big day. While many brides find their perfect veil while they are gown shopping, some high-end wedding dress alteration shops can create a custom veil for the bride-to-be. A custom veil can incorporate personal details, like material from your mother’s wedding dress, and be exactly as long or short as you would like. If you didn’t feel like any of the options you spotted at your bridal salon suited you, ask your tailor whether a custom veil is an option. Some bridal alteration shops will also preserve your dress for you after the wedding. This process of cleaning, treating, pressing and preserving the gown will protect it from yellowing, dust and damage. The service is more expensive than conventional dry-cleaning, but it’s the only way to ensure that this precious memento will last until your 50th wedding anniversary. If they offer such a service, make a plan to return after the honeymoon so that your dress can be properly preserved. Going into your early fittings with an expectation that your gown will feel and fit perfectly is only going to set you up for disappointment. All experienced seamstresses have a method that works well for them – some may not want to alter the hem before the bodice fits perfectly. Others may leave beads and lace off the part of the dress that is being altered and won’t sew them back in place until they are positive of the fit to save doing the work multiple times. Many sew the bustle in your dress in stages. Understanding these things and trusting your seamstress will go a long way to ease stress during those final months before the wedding day. Though all of the points made above are true, if something is of concern to you, speak up! Because alterations on a wedding gown take time, your tailor may work on it over several weeks in between fittings and if you wait too long, it may be too late. If you are worried about the fit of the gown, the way the bustle looks, or even the price of alterations, the sooner you say something, the better. After you authorize your tailor to do the work, he or she will move ahead with what you agreed upon and it may be too late to change anything at a later date. Getting your wedding dress altered can feel like one more tedious task on your long wedding checklist. Still, try to take time to enjoy the experience. A wedding dress is often the most beautiful gown a woman will ever wear, and one of the few that will be tailored to fit her exact form. Each alteration appointment gets you closer to that moment when you walk down the aisle looking like a princess.